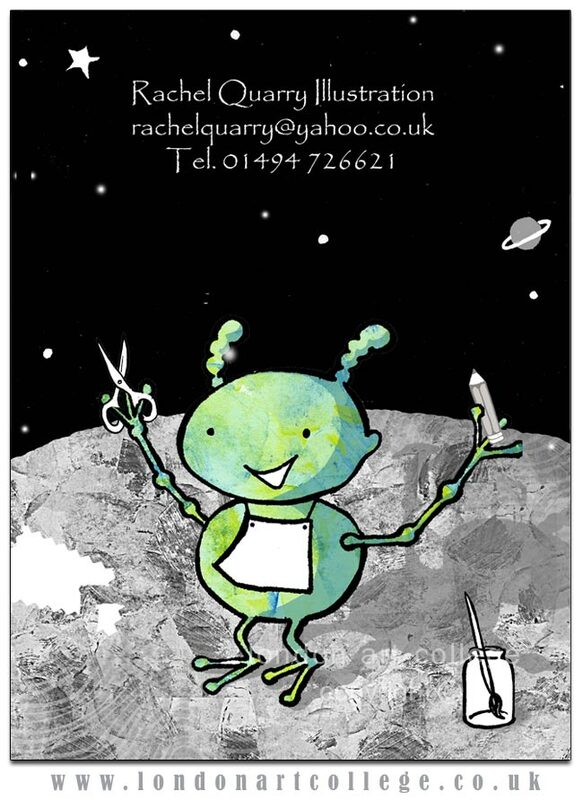 Our Illustrating Children’s Books Diploma tutor Maggy Roberts sent me an email from Rachel Quarry, one of her students, letting us know about an illustration competition she and 6 other illustrators had entered and won. I asked Rachel if she would write about it for our college news blog and she has very kindly send the text and illustrations below. We hope you enjoy reading and viewing Rachel’s wonderful artwork! 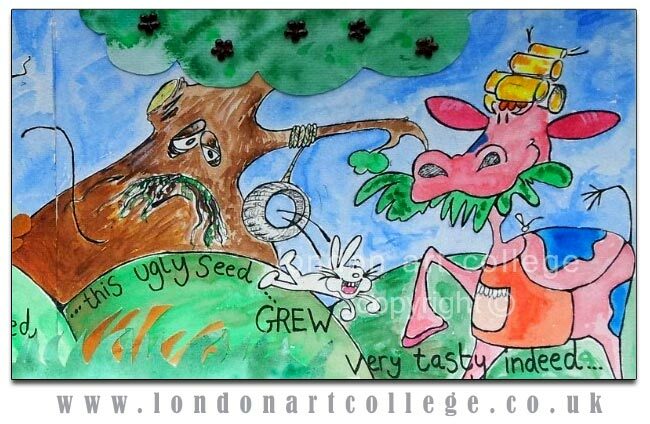 I am a student on the diploma course in Children’s Book Illustration. Although my background is in languages and finance, I have been interested in painting and drawing for many years and wanted to take a BA degree in Illustration. However, work and family commitments meant it was difficult to get to college every day, so I was thrilled to discover that this home study diploma was available. Last year a writer friend of mine told me about a new Illustration competition called ‘Undiscovered Voices’ run by the SCBWI (Society of Children’s Book Writers and Illustrators). 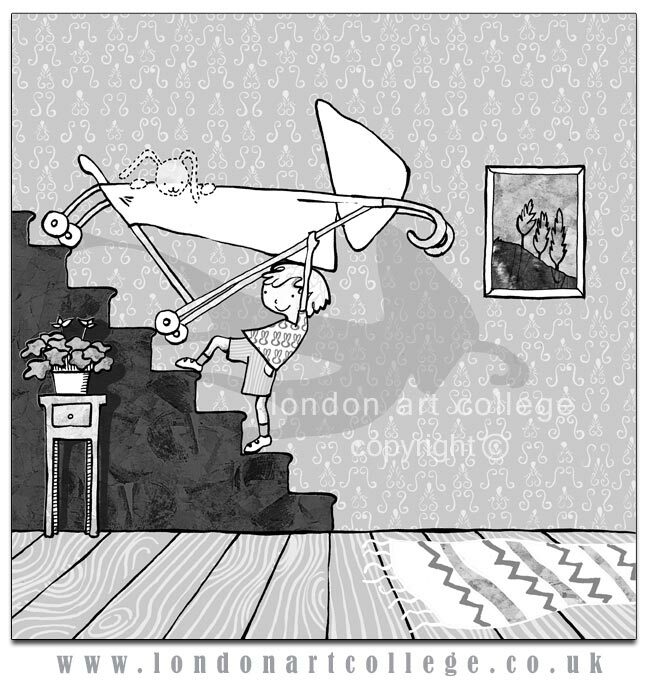 The competition was open to all unpublished illustrators, and the brief was to create a black and white illustration to the theme of ‘Undiscovered Voices’ to accompany an anthology of children’s stories aimed at the 7+ market. Among the judges were a children’s publisher, a children’s book agent, and Nick Sharratt the illustrator. 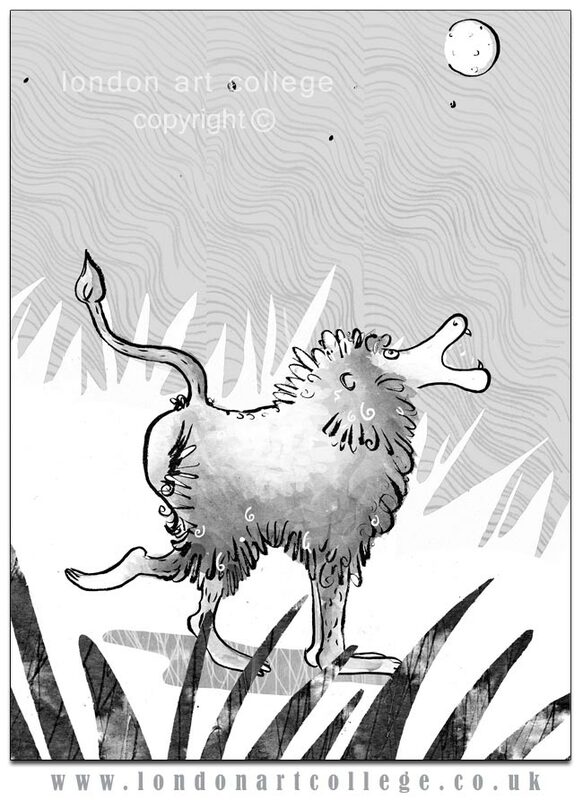 I had recently written my own children’s story about a baboon who loves to sing, and this inspired me to create a picture of a singing baboon for the competition. A few months later, to my surprise and delight, I received an email telling me that my picture was one of six winning entries. In January the six winners were invited to a portfolio workshop to prepare ourselves for the launch party, where we would get the chance to meet art directors and illustration agents and show them our work. I learned a huge amount – how to select and arrange pieces for a portfolio, and what art agents and directors look for. The judging team seized on a couple of black and white exercises that I had done for this diploma course, and told me to create more like it. I spent a busy month creating three new black and white pieces, adding the final touches to other pieces of artwork, building a website and designing my own business card. The launch party at the beginning of February was both daunting and exciting. 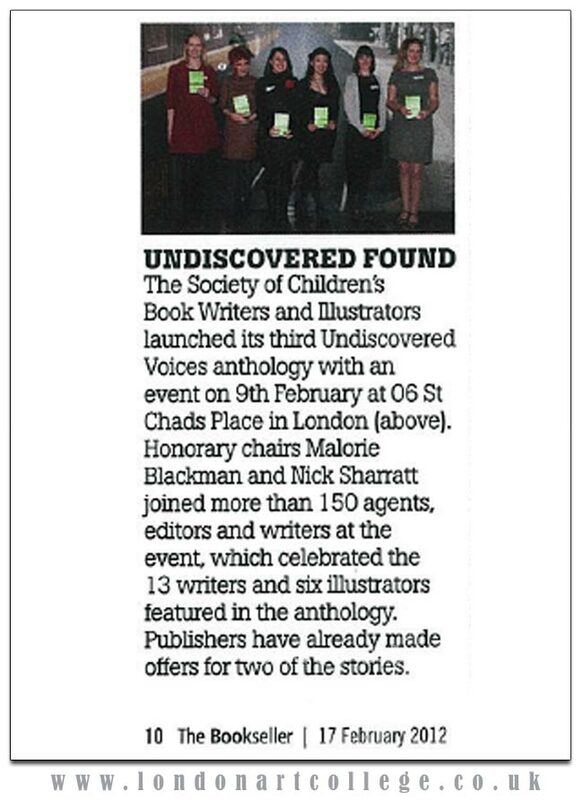 200 book agents and publishers had been sent a copy of the anthology and were invited to the event. Unfortunately the event clashed with a major MA Illustration show, and it seemed that most art directors and agents had gone to that, so we didn’t get as much exposure as we had hoped. However, I did talk to one art director who was very encouraging and gave me some good advice. I am looking forward to building up my portfolio on this diploma course. I am about to embark on my third project. I have hugely enjoyed working on the first two and been very grateful for Maggy’s encouraging and insightful feedback. Anyone who is interested in entering the second ‘Undiscovered Voices’ competition should keep an eye out for the announcement on www.scbwi.org early in 2013. Good luck! Our Children’s Illustration Tutor would like to recommend the book below to all of our students…. 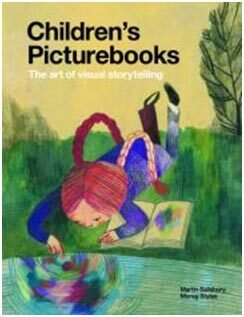 In seven chapters, this book covers the key stages of conceiving a narrative, creating a visual language and developing storyboards and design of a picturebook. The book includes interviews with leading children s picturebook illustrators, as well as case studies of their work. The picturebooks and artists featured hail from Australia, Belgium, Cuba, France, Germany, Hungary, Ireland, Italy, Japan, Norway, Poland, Portugal, Russia, Singapore, South Korea, Spain, Taiwan, the UK and the USA. Nick asked Mani if he would be able to write about his artwork and a little about himself for our college news blog. Below are two memorial paintings of Mani’s fellow soldiers, we thank Mani for sharing this with us. After my last critique my tutor Nick Beall suggested that it would be a good idea to post my portraits on the college news blog, I was very pleased that my tutor thought I had the talent to showcase my work on the college news blog. I am glad I have been given this opportunity to post and write a few words about my portraits and myself. I am originally from Nepal and at the moment I am serving in the British army as a Gurkha soldier. During my free time which is normally a few weekends, I like to draw anything that fascinates me. I am currently on the portraiture course. At the age of 15 I entered an art competition which was held in Nepal where I was awarded the ‘Best artist of the Zone’, it was a relief and honour to have won as it showed hard work pays off as only artists can realise how much hard work goes into an art work. I have never taken any art lessons in my entire life, except before the art competition where Mrs Saroja Khadki (Professional artist in Nepal) gave me some few tips on art. There is no artistic background in my family history therefore I had no support from my family to enhance my skills and have a career in art. Only when I won the art competition did I have a little support from my mother. 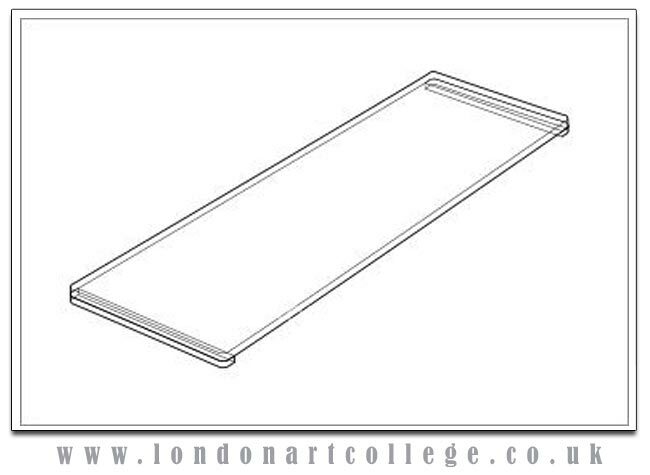 Since coming to UK after enrolling onto the portraiture course at the London Art College have I been able to once again work on drawing and paintings, use my techniques and skills in order to produce an artwork. Having this opportunity to create portraits again has enabled me to have the confidence to enter the art competition at the London Art College, where my portrait was selected as one of the finalists of the art competition 2011. 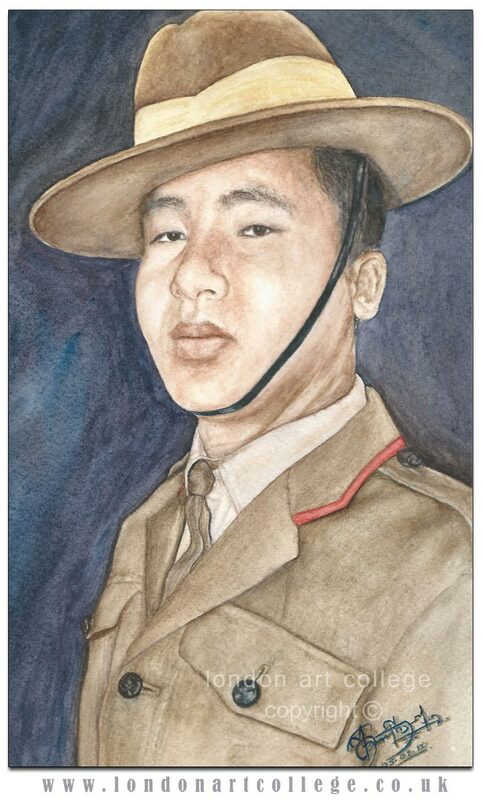 The portrait is of my late friend Ishor Gurung (Gurkha Soldier) who died while serving for the country in Afghanistan. His death was a great loss among us. In his memory I painted this portrait. I used water colours to paint this portrait. At first I lightly sketched an outline of the picture with a pencil in order to avoid any deep lines or marks on the paper. Before I started colouring the portrait I initially wet the paper. To avoid any unwanted lines and marks on the portrait, I had to finish the specific part before the paper dried up allowing time for the different colours to mix up in natural way. I have tried my best to capture my friend’s characteristic on my work. I have taken great care in choosing different colours in order to show the tonal value and effect of the light on the portrait. The bright/light parts in the painting is the paper itself which has been left untouched or lightly painted with a minimum pigments. This can be seen on the background where you can see the bright light falling on the wall and has been reflected. 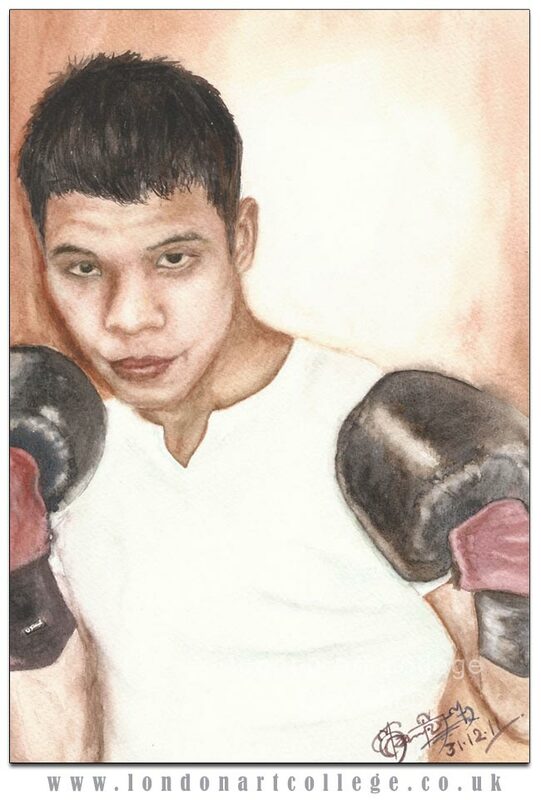 I had to mainly concentrate on his face and the boxing gloves as they are the main focal points in the portrait. To create a little bit 3D effect on the picture I have casted the shadow of his head on the wall on the right hand side increasing the pigments concentration. The young soldier in khaki dress is also my friend (Suraj Gurung) who was killed in Afghanistan. Again I have used water colour and same techniques here. I have worked from the lightest to the darkest part. The shadow on hat and the dress are very rich in pigments with the mixture of greys, purples and crimsons, which give them the cool colours. I have used layer over layer to enrich the colour pigments in the painting where necessary. The red edging has significance within the uniform that stands out in the portrait reflects the brave and courage. This portrait shows a smart proud soldier standing with his head held high. Finally I would like to thank my tutor Nick for all his time, help and advice which in the future will help me to become one of the good artists of this generation. We have just received this email about the newly announced “Prince of Wales Award for Outstanding Miniature Painting”. We hope that you enjoy entering. If you win – let us know! between 16 to 28 October. interiors and wildlife. Small, stunning sculpture is also shown. years shows achieving record sales. I asked Terry if he would write something for us about his wonderful artwork. He is currently studying the Coloured pencil course with Julie Douglas and I think you will find his text very interesting. If you are a coloured pencil artist, make sure you check out his useful tip too! Hello to all fellow artists, I am living proof that old illustrators never die they just change direction. 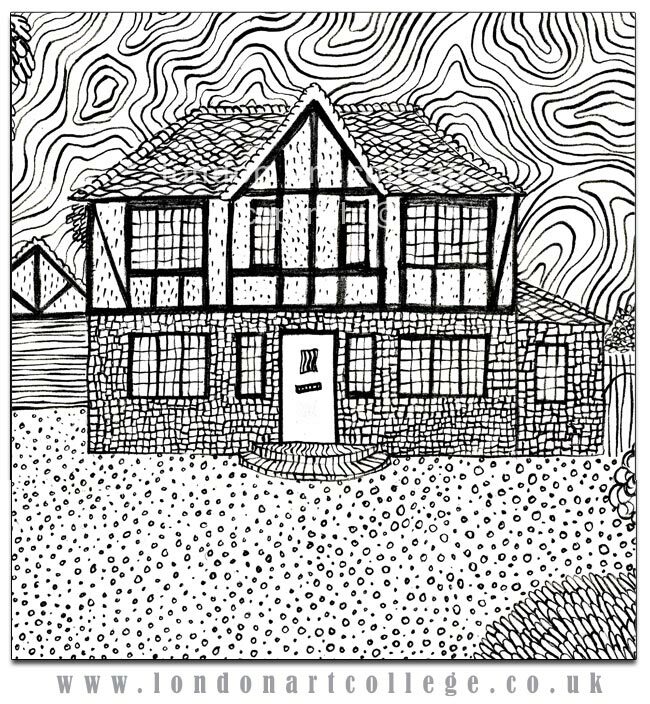 Melanie has also asked me to write a piece about a couple of drawings recently completed and a bit about myself. 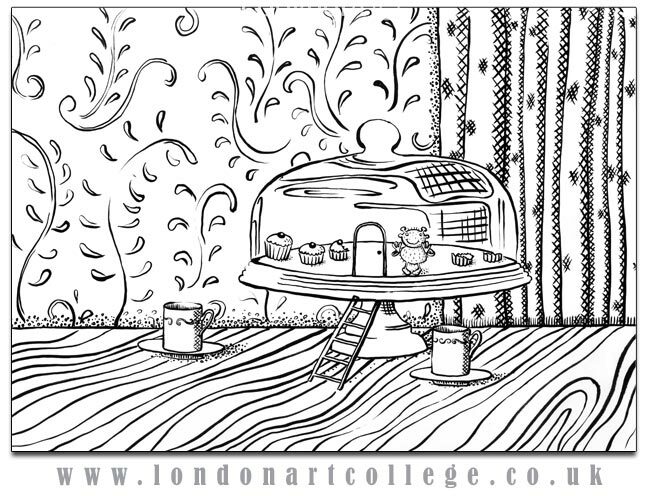 I worked as a Technical Illustrator for my working life ending up teaching the subject at one Bristol City College. I have always drawn, painted and made things from my early years. Only drawback I could find was the statement by my father who said “You can’t make a living out of drawing son,” and promptly signed me up for an engineering apprenticeship, which meant I had to find a way to prove him wrong. It was pure chance I became aware of the career of illustrating and it took a showdown with the apprentice supervisor to get onto my chosen path. As with all careers there is a plus and minus side. Long hours spent at the drawing board tempered my enthusiasm for drawing, since retiring I have occasionally got the sketch book out but not as regularly as I should. However last year I found a book on drawing with colour pencils, a very different medium to any other I have used. And it sparked my interest, I had to have ago. Collecting all those wonderful colour pencils has also been colourful acquisitive thing to. I signed up for the Colour Pencil Course and I have thoroughly enjoyed finding out how to use them with the help and encouragement of Julie Douglas. That really ought to read I am still finding out how to use them. 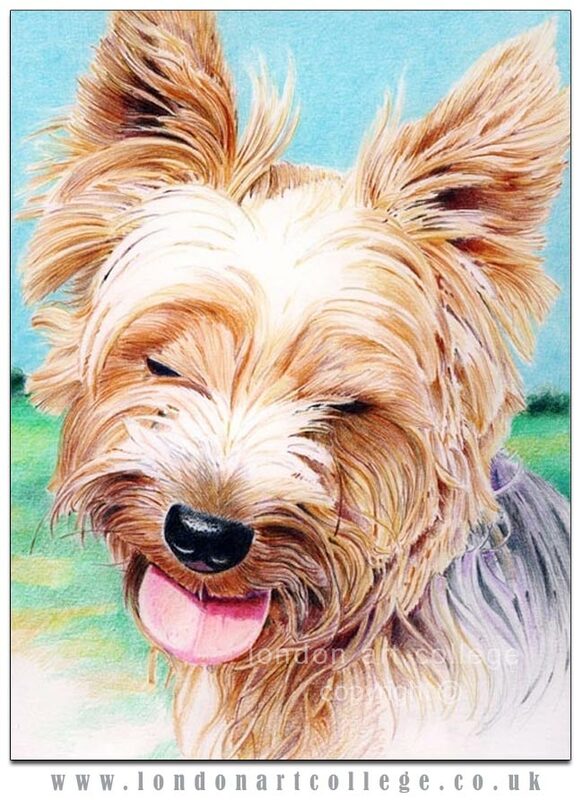 For one of the drawings in set 3 I have chosen the portrait of our departed Yorkshire Terrier, Jody, she was a lovely animal and we have fond memories of her, but she was not a candidate for Mensa! The portrait was taken with a promise to my wife I would “do a drawing” At long last I have fulfilled my obligation and it captures Jody’s personality, all hair and with her slightly bewildered expression. We still miss her and her buddy Kizzy very much. When we weaken and consider having another “dawg” we get the vets bills out and quickly change our minds! The other picture of our local redundant church is something we pass most days on our regular walk. Although the Church is only used on special occasions the graveyard is still in use so it does not feel redundant. As I write this the Snowdrops are in full fettle the church has a Cotswold roof covered in moss and lichen. It was great analizing the colours in the roof & wall also the tower with the paint gradually wearing away, it looks like soured cream poured down it but we are assured that it was originally painted to protect the tower. It is right on the edge of the Cotswolds and it really does blow a cold wind up there. I think the red post box let very insecurely into the wall gives it dash of colour I am pleased to have recorded the old Church. We have received an email with information about the London 2012 International Creative Competition and we thought our students might be interested. Remember – if you win let us know! The 2012 London International Creative Competition is accepting entries now. LICC invites all visual artists to submit their creative work for inclusion in the LICC AWARDS CEREMONY. The artwork is juried by a board of internationally esteemed artists, writers, curators, gallery owners and other luminaries of the visual arts. There is no limit to creativity. LICC has no boundaries and encourages you to push the envelope of your creativity. All disciplines are accepted. Prize: £2,000 cash prize, work published in LICC’s annual Book of Creative Designs and receives the much sought after LICC Trophy at the LICC Awards Ceremony in September 2012. Each of the 15 Final Selection winners will receive a segment of the LICC Awards Trophy. When each trophy is fit together, it will form a completed piece of art work, like a jigsaw puzzle. On the 10th anniversary of LICC, all the artist along with their trophies, will gather together and present their altered trophy. At that time, these piece will be united, combined, and put on display at an exhibition in London. When these separate trophies are placed together, they will embody a masterpiece of collaboration. 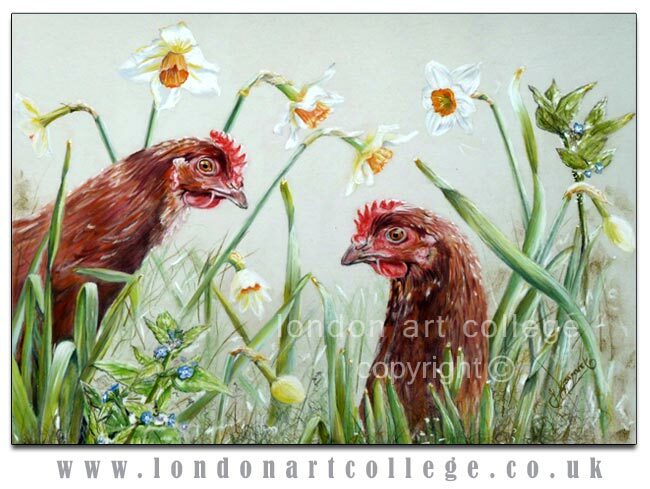 LICC is managed by iAwards, Inc.
Hi I’m currently working my way through the pets portrait diploma course and after my last critique my tutor Melanie asked if I’d like to write a blog about my piece the “spring Chickens” which she liked. I was inspired watching my own girls “Gloria” and “Pixie” scratching and rooting around at the bottom of my garden scraping up my daffodils and other lovely spring flowers! I chose to use the images I’d taken of them for the exercise on combining two head studies into one composition in set 4. I wanted my painting to show some of the hen’s character and zany look and also my flowers to have a natural hap – hazard feel to them so I spent a bit of time working out the best composition to achieve this. I had to flip one of the images so that it was looking toward the other bird, and I had to pay attention to the direction of light and invent some on the left hand bird. I also wanted the viewer’s eyes to circulate my picture and thought that I could use the flowers and leaves to help do this. I tried to have most of the larger background daffodils placed so that they were facing into the centre of the picture but had the odd one looking out and by adding a mix of fully open and budded flowers I hoped to keep it all natural. I drew the flowers directly above the hens with a darker trumpet as I thought this would direct the focus down to the hens. I also wanted my picture to have a sense of depth so I tried to be careful and not paint the background flowers to deeply as they might have taken the focus away from the chickens. 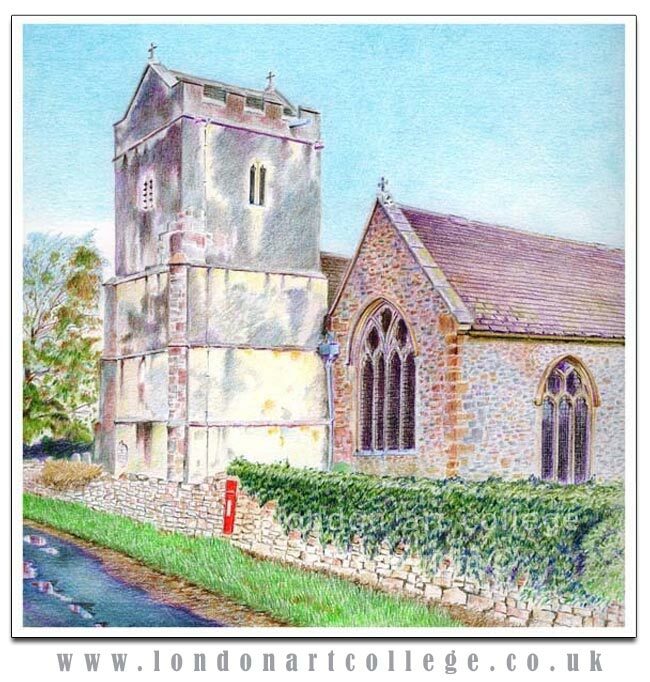 This piece was painted on pastel mat using Derwent pastel pencils. I worked on it over Christmas and got a little frustrated with it half way through, but I’m happy with the end result I hope you like it too. 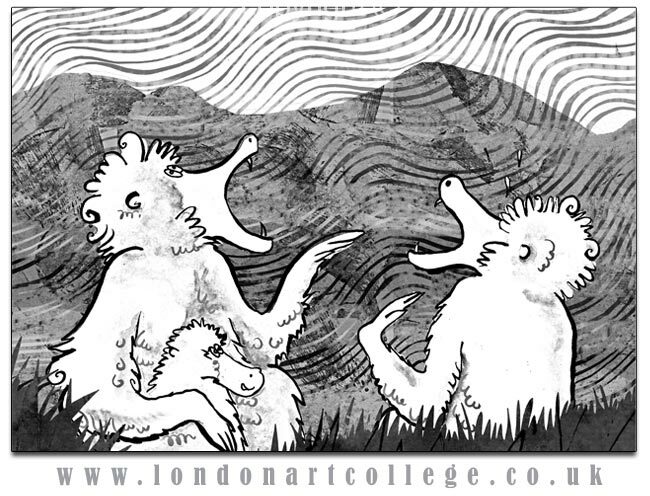 Nicolas First step into the Illustrating Children’s Books Diploma…. 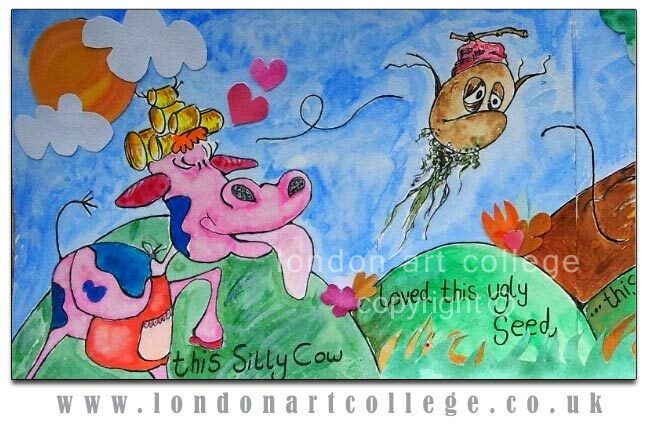 My name is Nicola and I am new to the Illustrating Children’s Books Diploma. I must admit, I was tentative about starting. I hadn’t drawn or put pen to paper in years and I was unsure as to what I maybe able to deliver. I had seen so many impressive submissions from other students and was wondering what I would come out with. The picture I put together was for the first brief: “Tiny Seed” and left alot for artistic interpretation. This is what I love – letting my mind work overdrive and getting silly with ideas. I was obviously very out of practice and just thought….”ok lets have fun with this, and if it doesnt turn out right then think of it a learning curve”. This enabled me to relax and get into gear. I have always been very cheeky and like to add humour to all my work……and life. So, the “silly cow” idea was born. I have never used water colour before and was excited to try the new medium. Firstly, I had to have the idea, and once the idea was there the rest was free flowing. (albeit with plenty of hiccups). Firstly I discovered the wonders of quality paints. This was suggested by Maggie in the course material, and she was unsuprisingly correct !! I had tried the first exersize using my 2 year old sons 99p paints and the colours are so dissappointing. So I invested in some quality water colours and brushes and it was well worth it. I pencilled my drawing straight to water colour paper. I used a thin nib so I could rub out mistakes easily and then I went over the drawing using a black ink art pen. The next part was to add the colours and my quality brushes made life so much easier for me. The brushes held the paint so well and were excellent at the areas which required detail. I was very worried that it would “bleed” and smudge but this was not the case, and I thank my wonderful tools for this. I am huge fan of contrast and texture, and there was NO WAY I was going to paint the cows the standard black and white. This was where my first bit of training has come into play. I used the wet on wet collage technique that is discussed in the first part of the course. I loved it and Maggie asked whether I would use it for future illustrations…..and the answer is “yes”. The grass, clouds, tree, flowers and hearts are all on seperate water colour paper and stuck on with glue. I really enjoy this technique and think it really adds to the picture. I have only really started the course and feel I am learning so much already. I would certainly recommend it to any future budding artist, and if anyone is like me and has doubts at the start or any lack of confidence then fear not: I truely believe the best art is delivered when you are just having fun and experimenting.